offer some great options for the many watersport activities you may wish to pursue on your vacation to Key West. We will help you choose a beach that best fits your needs. Some beaches in Key West are better suited than others for certain activities such as snorkeling or walking your dog. Whichever beach you choose they all have one thing in common. 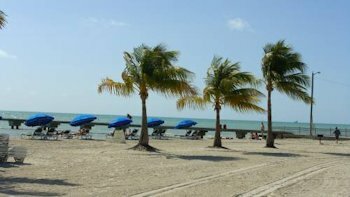 You'll be able to enjoy the tropical Caribbean weather at any beach you choose, which of course is what Key West is all about. 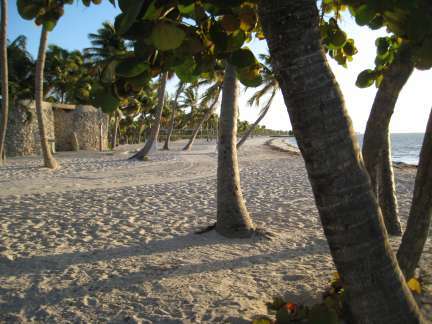 is the largest and best beach in Key West, Smathers Beach. Smathers is among the favorite beaches of the locals and it's known for it's many activities. The beach features many vendors selling food and drinks and vendors offering everything imaginable including sail boats, jet ski's and parasailing. There's little surf, on Smather's but you can swim out a long ways before going over your head and there's NO danger of an undertow! Life's good at Smather's Beach... Smather's features a long wide beach area and it has rest rooms and an area to shower off the salt water. There is good parking, lots of rental huts, bike paths, picnic tables, and volleyball nets. Smathers is located on S. Roosevelt Boulevard. best beach in the Key West area. The Fort Zachary Taylor Beach is located at the very Southwestern tip of the island in the Fort Zachary State Park. Entrance to the State Park is through the Truman Annex on Southard Street. The park opens at 8:00 AM and is open until sunset. The park has an admission fee of $8.50 per vehicle or $2 for pedestrians or bikes. better beaches in Key West. 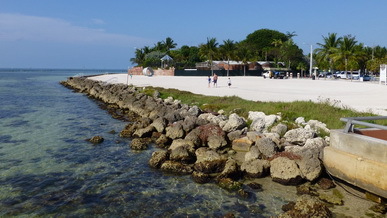 The beach is usually a little more quiet that most of the other beaches in Key West. The beach has a nice rest room and changing facility with showers. The beach also features a rental hut for any beach equipment that you might need, a gift store and a small restaurant called the Cayo Hueso which is available for wedding catering. The beach is one of the islands more popular wedding locations and it has numerous picnic tables located under the palms trees that make for a great picnic area. The Fort Zachary Taylor beach is one of the better beaches in Key West for snorkeling. There are a couple of man made breakers that offer hiding places for many small fish and sea creatures. If you're a fisherman there's an area next to the beach, a rocky stretch on the west shoreline, that is a very popular spot for the local fisherman. We highly reccommend spending a day at the Fort Zachary Taylor Beach if you are planning a trip to Key West. Higgs is considered a good beach for sun bathing and there is a play area that the kids will enjoy. Higgs has decent facilities including, rest rooms, water sport rentals, rental huts and picnic areas. Higgs also features a neat little and unique restaurant called "Salute on the Beach" that sits right on the beach. 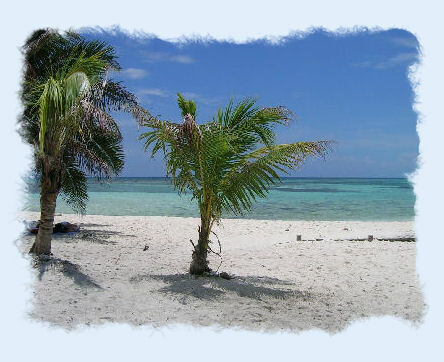 Key West's Higg's Beach is also one of the better beaches in Key West for snorkeling. The beach area is generous and their is a very nice pier that extends a good distance into the ocean that makes for good sightseeing. The pier also features two ladders that make easy access for both swimmers and snorkeling. There are also a number of old wooden dock supports in the water starting at the end of the pier that provide a safe haven for fish and other marine life. The shallow areas of the beach are relatively free of weeds and vegetation which is another reason Higgs is a good choice. There is an abundance of free parking, which makes Higgs one of the islands more popular beaches. Location: End of Reynold's St. & Atlantic Blvd. South beach is located at the Southern end of world famous Duval Street on the Atlantic Ocean. The beach is conveniently located near a number of restaurants with shopping opportunities nearby as well. South Beach is small compared to other area beaches but it is fairly well maintained. The Southernmost Beach Cafe is situated at the end of the beach and the cafe features a distinct caribbean atmosphere. There are few rental concessions located on the beach but you can rent beach chairs and umbrellas. There are NO rest rooms located on the beach other than those located in the Southernmost Cafe, which is sort of a drawback. Even so the beach is still a favorite for many of the local crowd. Rest Beach is situated just east of Higgs Beach right next to the White St. Pier. The pier provides a great view of the islands shoreline and the surrounding beach areas. The sand on the beach is a little grainy but not bad and there is some plant life to deal with. There are no restrooms but it's just a short walk to get to the rest rooms on Higgs Beach. Rest Beach is also a decent beach to snorkel since it is situated right next to the White Street Pier which makes for some excellent fish habitat. Rest Beach is wheelchair accessible and the beach has a nice picnic area. Overall it's a neat little beach that gets overlooked by many. The appropriately named Dog Beach is a perfect spot to take your four legged best buddy for a run along the ocean beach. The beach has a few palm trees and more that a few rocks (Fido won't mind). The beach has no restroom or rental facilities present. Dog Beach is within close proximity to a couple of the islands southern most restaurants and bars. (Louie's Back Yard and the After Deck Saloon.) Both places provide a nice atmosphere for relaxing and viewing the ocean. The beach is located at intersection of Vernon and Waddell St.